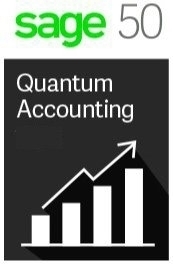 Download Sage 50 Quantum Accounting 2018 Now! Get one hour of training FREE when you buy your Sage 50 Quantum Accounting software from CBA. A Certified Sage Intelligence Consultant from CBA will show you how to create your own personalized reports using Sage 50 Intelligence Reporting. Sage 50 Quantum Accounting is more than business accounting software � it's a business management solution. Quantum Accounting gives you the ease of use of an out-of-the-box solution at an affordable price. With Quantum you can monitor and manage every aspect of your business all in one centralized system. More than just an accounting program, it also helps you manage your customers, vendors, and employees, your inventory, services, and jobs, and more. Sage 50 Intelligence Reporting, Financial Management, Workflow Management, Workflow Automation, Interactive Job Reporting, Advanced Budgeting, industry specific features � these are just some of the in-product tools that will help drive your business to success. Sage 50 Quantum Accounting includes many analytical tools so you can make more informed decisions and make them faster. Sage 50 Quantum Accounting provides all your core accounting needs � plus, it incorporates functional and collaborative tools and features that help you run your operation more efficiently. Centralized management centers � Sage 50 Quantum Accounting is your one-stop shop for managing each customer, inventory item, service item, or job. Get the details quickly with customizable dashboard views and highlight the information you need to better serve your customers, as well as make more informed, more profitable business decisions. Customize your Sage 50 Quantum Accounting screens to show personalized information on My Dashboard with 46 modules to choose from. My Dashboard�s birds-eye view and easy access to real-time tasks and information empower your teams to manage their own work more efficiently. The latest version of Sage 50 Quantum Accounting with updates for as long as you're enrolled. Unlimited5 access to technical support analysts by phone, email, and online chat for your Sage 50 solution. 3 Sage 50 does not impose a hard limit on database capacity, however, individual performance will vary depending on actual number of transactions, database size, and number of concurrent users. Data management efficiencies are also realized in the Sage 50 Accounting 2018 products. 5 Customer support analysts are available from 9:00 a.m. until 8:00 p.m. ET Monday-Friday, and reserve the right to limit calls to one hour or one incident. Assistance is limited to Sage 50 solutions.